The graceful shape of the princess cut diamond will make your solitaire diamond pendant appear larger than what it really is. 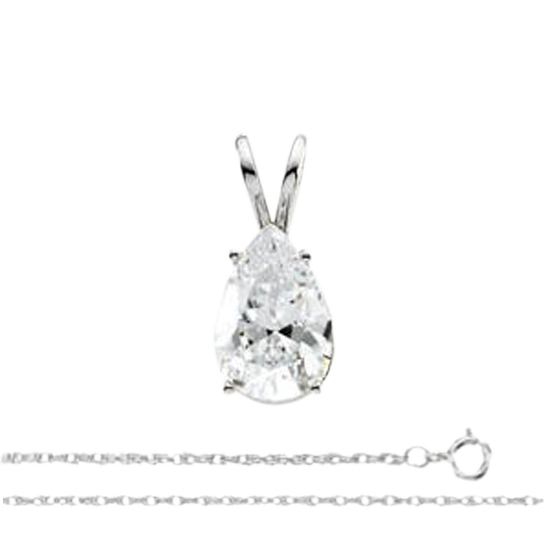 Anyone can look like royalty with one of our princess cut diamond pendants from our large collection of Princess shapes. We carry a large range of Princess shaped diamonds from 0.50 carats to over 5.00 carats in colors ranging from D – M and clarity from VVS1- I2. Some of our Princess cut diamonds are certified by the IGL. We also sell clarity enhanced and laser drilled Princess shaped diamonds. The chains for our princess cut pendants come in a range of sizes from 16, 18, and 20 inches in length and in as snake, Singapore and box chain styles. The diamonds are set in bezel or four prong settings in 14k white or yellow gold. The Princess shape makes a wonderful Sweet Sixteen birthday present.